I've been itching to bake lately but haven't because I don't want it in the house to tempt me. Well, I gave in today because this heat wave is killer and I wanted to sit in the ac! Sitting in the house means keeping the boys as busy as possible so we painted seashells, played legos and made cookies!I cut down the amount of butter and sugar, swapped out white flour for stone ground whole wheat flour, threw in some oats and used unsweetened applesauce to moisten them up. Of course because they were for the kiddos they convinced me to throw in some mini m&ms we had. Certainly, to make these healthier take out the m&ms and use chopped raisins or dried figs. 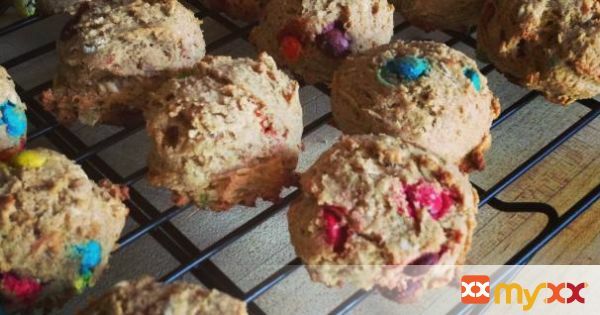 These are a great substitute for a traditional cookie because you don't have to feel so bad about having one or letting the kids have an extra. 1. In a large bowl, using a hand mixer, cream together the butter and brown sugar until well combined. 2. Add in the egg and vanilla and again mix to combine. 3. Mix in the applesauce and combine. It will look a little broken but thats ok! 4. In a small bowl combine the flour, oats, baking powder and salt. 5. Slowly combine the dry mix into the wet until it just comes together, do not over mix! 7. Using a small cookie scoop place the cookies onto a lined baking sheet. 8. Bake for approx 12-14 minutes at 375 degrees, until lightly golden. 9. These cookies will not change shape much because there is so little fat in there. 10. So scoop out and press down lightly if you want them to flatten a bit. 11. Now grab a glass of milk and DUNK!